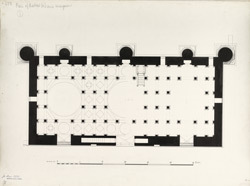 Plan of Haibat Khan's mosque at Ahmadabad in Gujarat from James Burgess' 'Original Drawings [of] Muhammadan Architecture of Ahmadabad.' Sultan Ahmad Shah (r.1411-42) founded the city of Ahmadabad in 1411 and was responsible for the construction of several buildings and mosques. The city's development was assisted by the patronage of other noblemen at Ahmad Shah's court, including Haibat Khan, who built the Haibat Khan mosque in 1425. It lies north-east of the Jamalpur gate in the southern part of the city. Similar in design to Ahmad Shah's mosque (c.1414), this mosque utilized Hindu architectural and decorative features which included the use of pillars from an earlier temple that had been salvages.